Breakout stars of the notorious Bravo hit show “The Real Housewives of Orange County,” Heather and Terry Dubrow’s sophistication, classic style, love of family, magnetic personalities and unsurpassed wit are the reasons viewers are tuning in every week to watch a show that scandalously chronicles the lives of five women in one of Southern California's wealthiest communities. 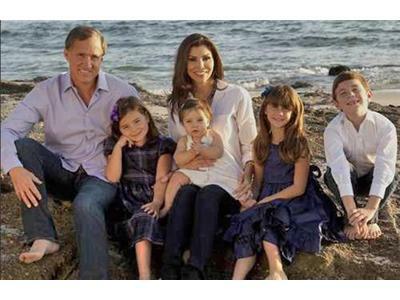 Heather Dubrow successfully manages a Superwoman kind of persona, as a busy Mom who blends Hollywood and household with her world-renowned plastic surgeon husband, Dr. Terry Dubrow and their four children, which include 8-year old boy and girl twins, and 5-year old and 10 month old daughters. As "Housewives" favorites, the Dubrows shine on camera as a power couple juggling their family life with multiple business ventures. No stranger to the spotlight, Heather was a quadruple threat who spent her life performing as a singer, dancer, pianist, and actress before dedicating her life to become a fulltime mom. With a Bachelor of Fine Arts in Musical Theater from Syracuse University, she moved to Los Angeles to persue her acting dreams, and enjoyed starring roles in "Married..With Children," "Nowhere Man," "Life with Roger," "Early Edition," and many more. Terry Dubrow completed an extensive medical program at both Yale and UCLA and was both a successful plastic surgeon and eligible bachelor when a friend arranged a blind date with Heather Paige Kent, whom he'd seen in "Life with Roger," and they married three years later. Terry promised Heather that she could pursue her acting career if she headlined her own show. A few months later, she was cast as the lead in "That's Life." Terry has appeared as an expert on "The View" and other shows, and Dr. Oz calls him one of the top plastic surgeons in the world.